Although the stars of the film, Orson Welles as Harry Lime and Joseph Cotton as Rollo (changed to "Holly" for the film) Martins were American, the two main characters in the book are quintessential Englishmen who were at the same public school. Graham Greene wrote the novella first ("to me it is impossible to write a film play without first writing the story" Greene wrote later) and then adapted it for the screenplay. The story is written in the first person from the point of view of the British chief of police, the part played in the film by Trevor Howard. He is investigating the death of Harry Lime when Rollo Martins, a writer of Westerns, arrives in Vienna to visit his old school friend and gets inextricably involved in the mystery. While the classic film is slightly different, in general it follows rather closely. but I was struck this time through by some of the literary/symbolic strengths that i had not noticed previously when i listened to it and it will add greater depth to the film as well upon next viewing. I think a nice "paper" could be written on the novel and perhaps a comparison piece. I've read/listened to almost all of Greene and have enjoyed them all and look forward to revisiting a couple of favorites. Similar to LeCarre in the sense that the novels are well written stylistically, and that there is more going on with the language and characters and symbolism than in run of the mill pop thrillers. Hope for Travels With My Aunt someday, very funny and a favorite that should be available. A favorite film becomes a favorite book. Jarvis is an exceptional reviewer. As a fan of the film, I wondered if the book would live up to Carol Reed's classic. However, Greene's prose is so exceptionally funny and dark that I was on the edge of my seat throughout the reading, even though I already know how it all ends. Wonderful. Very nice Graham Greene: taut, great sense of place, frustrating main character, even that theme playing in the background at key spots. I love Graham Greene's work and this is one of his most enjoyable stories. The setting is Austria during the four power occupation just after the end of the last world war. We encounter a down and out western novelist traveling to Vienna at the invitation of his dear old friend. He arrives with little money and no real prospects just in time to attend his friend's funeral. Shortly afterwards the mystery of his friend's death begins to unfold. What other book might you compare The Third Man to and why? Any old 1940s detective murder mystery. My favorite scene gives too much away for a review. An amusing scene not related to Lime's death is Martins drunken discussion with the "book club" members who have mistaken Martins for another author named Dexter, which is also Matins' pen name. Martins accepts their hospitality and free hotel room. However, their Mr. Dexter does not write cheap paperback westerns and they have a difficult time understanding Martins' references to Zane Grey. If you could rename The Third Man, what would you call it? I cannot think of a better title. 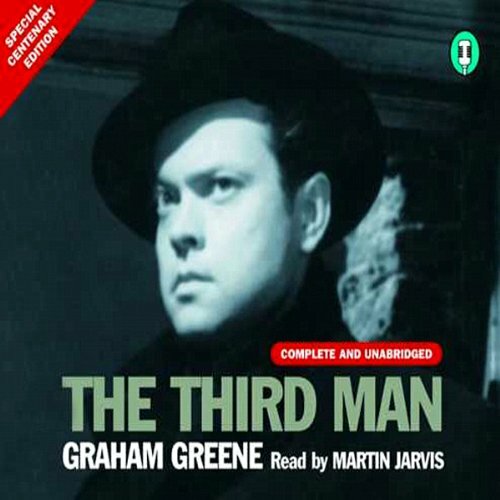 The Third Man is perfect! Although the book is short, it is a great story with a number of twists. If you have not read Greene, this is a great starter for you. If you liked the classic movie, you'll enjoy this book, if only to discover how faithful Carol Reed reproduced Graham Greene's classic for the screen. About the only difference is the ending (which I think the movie did better). Narrator Martin Jarvis is excellent, as usual. The movie (and naturally including it's music) is my favourite noir film. Here is the story that was written for the movie, so well read by Martin Jarvis. Of course as I listened, the imagery from the movie was evoked. Most interesting for me was in learning that both Harry and Rollo were English, not American. It was the character of Rollo that developed more depth in the story. An English writer of American Westerns who is used to getting the girl he wants becomes a much more likely pal of Harry. I want to watch the movie again, to see if Rollo still seems as simple as I remember. I loved the revisit to a familiar story in audible form and the reminder of the film in the tune. Of course the basis for one of the greatest movies of all times, but the story by itself...Wonderful. I am stunned struck by the story. Of course I still see Orson Wells' Harry Lime.